For the 2002 UK play, see The Mentalists (play). The Mentalist is an American drama television series that ran from September 23, 2008, until February 18, 2015, broadcasting 151 episodes over seven seasons, on CBS. Created by Bruno Heller, who was also its executive producer, the show follows former "psychic" Patrick Jane (Simon Baker), who is a consultant to the California Bureau of Investigation (CBI), using the highly developed observational skills he previously employed to "read" people's minds. The series follows Patrick Jane, an independent consultant for the California Bureau of Investigation (CBI) based in Sacramento, California. Although not an officer of the law, he uses his skills from his former career as a successful, yet admittedly fraudulent, psychic medium to help a team of CBI agents solve murders. The real reason for Jane's involvement with law enforcement is to track down the serial killer known as Red John, who was responsible for the brutal murders of his wife, Angela Ruskin Jane, and his daughter, Charlotte Anne Jane. Before the murders, Jane had a lucrative career as a con man, successfully posing as a psychic medium and enjoyed near-celebrity status. Five years before the events in the show's pilot episode, he appeared on television to claim that his paranormal abilities helped the police profile a serial killer named Red John. Red John, angered by the perceived slight, murdered Jane's wife and his young daughter in revenge. Jane subsequently abandoned his career and teamed with the CBI, using his skills to help them solve various crimes. His main focus is on the cases involving Red John or Red John copycats. He admits to faking the supernatural aspects of his skills, often asserting that "there's no such thing as psychics", yet he has finely honed skills in cold reading, hypnosis, and picking pockets, as well as his intuitive observations and an immense insight into the human psyche and the behavior of witnesses. His associates at the CBI include their boss, Teresa Lisbon, and colleagues Wayne Rigsby, Grace Van Pelt, and Kimball Cho. Various directors and recurring civilians come across as the show unfolds, including Sam Bosco and Gale Bertram, and Kristina Frye and Walter Mashburn. As the show progresses, the focus shifts from general cases through seasons one to three, to solely catching Red John, through seasons four to six. At the midpoint of season six, the Red John case is solved, the FBI steps in, closing the CBI, and the show adopts a new track for two seasons, along with a few new characters. The show often set episodes based on fictional locales with names such as Salinger Mill and Rancho Rosa. Like the majority of American television shows, The Mentalist was mostly filmed within the studio zone in Los Angeles County, but occasionally filmed a few scenes on location in Sacramento. The structure used to represent the CBI headquarters in Sacramento is the back of the Pico House in downtown Los Angeles. On October 15, 2008, CBS ordered the first season of The Mentalist and the show has subsequently been renewed annually since 2010, both in the domestic market and overseas. TNT began syndicating The Mentalist in the fall of 2011. In the period between the end of Late Show with David Letterman and Late Show with Stephen Colbert in the summer of 2015, The Mentalist was carried weeknights on CBS in full as part of the network's temporary late-night lineup. In November 2013, Amanda Righetti (Van Pelt) and Owain Yeoman (Rigsby) were confirmed to be leaving after season six concluded. On May 10, 2014, CBS renewed the series for a 13-episode seventh season, which premiered on November 30, 2014, and later announced it as the final season. In the season-seven episode "Orange Blossom Ice Cream", scenes set in Beirut were filmed in Los Angeles and supplemented by freelance footage of Beirut by Michael Timney. ^ Owain Yeoman left the series in episode 15 of season 6. ^ Amanda Righetti was absent from four episodes in the latter half of season five due to her pregnancy. She left the series in episode 15 of season six. ^ Josie Loren's character was killed off in episode 10 of season seven. 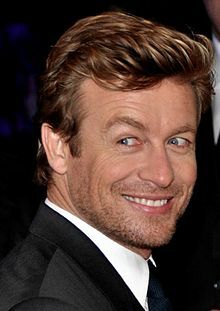 The first season of The Mentalist received mostly positive reviews, with critics being divided on the procedural format, but praising the performance of Simon Baker. On Rotten Tomatoes, season one had an overall rating of 53% from 19 critics, with the consensus saying, "The setup and episodic storytelling is far from original, but The Mentalist distinguishes itself from other procedurals mostly due to the talents of Simon Baker." On Metacritic, season one has a score of 65/100, indicating "generally favorable reviews". Robert Bianco of USA Today felt the pilot episode lacked in originality, but praised Baker, saying, "The Mentalist may be a copy, but it's a well-done copy sparked by an actor who has come into his own as a TV star." Matthew Gilbert of The Boston Globe said, "the CBS show has very little dramatic heft or distinction, but it's wily and brisk enough to engage you for an hour." Gilbert also praised the chemistry between Baker and Tunney, but criticized the crime cases, feeling they were predictable and at times uninteresting. Mary McNamara of The Los Angeles Times praised Baker as "virtually irresistible" and said, "...psychological sleight of hand can't fill an hour every week. For that you need complicated, interesting crimes and complicated, interesting characters solving them. The Mentalist seems prepared to deliver just that." The pilot episode had an audience of 15.6 million viewers in its first airing, and 7.8 million in a reairing three days later. The December 2, 2008, episode, "Flame Red", was the highest-rated television show of the week, marking the first time a program in its first season had achieved that distinction since Desperate Housewives four years earlier. The show drew comparisons to the USA Network comedy Psych, which also featured a lead character with heightened powers of observation that were mistaken for psychic abilities, who works as an independent consultant for law enforcement in California, and which debuted two years earlier, including Psych itself making repeated references to the similarities with the later-premiering show. For the ratings of individual episodes, see List of The Mentalist episodes. 2009: 25th TCA Awards for "Outstanding new program"
2009: People's Choice Award for "Favorite New TV Drama"
^ "Breaking News – Cbs Gives A Full Season Order To "The Mentalist"". thefutoncritic.com. June 29, 2010. Retrieved July 6, 2010. ^ "Fall TV: CBS Announces Premiere Dates". TVGuide.com. Retrieved June 24, 2009. ^ McDuffee, Debbie (November 6, 2009). "TNT: The little network with the smart decisions". CliqueClack TV. Archived from the original on November 9, 2009. Retrieved November 6, 2009. ^ "Amanda Righetti Confirms Mentalist Exit". TVGuide.com. November 23, 2013. Retrieved December 11, 2017. ^ Kondolojy, Amanda (May 10, 2014). "'The Mentalist' Renewed for Seventh Season by CBS". TV by the Numbers. Retrieved May 10, 2014. ^ Owen, Rob (May 23, 2014). "TV Q&A: 'Criminal Minds,' 'Nashville' and 'The Mentalist'". Pittsburgh Post-Gazette. Retrieved May 23, 2014. ^ Kondolojy, Amanda (September 27, 2014). "'The Mentalist' Upcoming Season Confirmed to be Last". TV by the Numbers. Archived from the original on September 29, 2014. Retrieved September 29, 2014. ^ Owen, Rob (December 26, 2014). "Q&A: 'Hannibal,' 'Bates Motel' and Turner Classic Movies". Pittsburgh Post-Gazette. ^ "The Mentalist: Season 1 (2008-2009)". rottentomatoes.com. 2009. Retrieved August 29, 2014. ^ "The Mentalist - Season 1 Reviews". Metacritic. 2009. Retrieved August 29, 2014. ^ "'The Mentalist' is familiar but smartly done". September 23, 2008. Retrieved August 29, 2014. ^ "Character and chemistry carry 'The Mentalist'". The Boston Globe. September 23, 2008. Retrieved August 29, 2014. ^ "Review: 'The Mentalist'". The Los Angeles Times. September 23, 2008. Retrieved August 29, 2014. ^ "Breaking News—CBS Wins Premiere Tuesday With Its Largest Audience On The Night Since 2001". thefutoncritic.com. June 29, 2010. Retrieved July 6, 2010. ^ Collins, Scott (December 9, 2008). "CBS takes weekly ratings as 'Mentalist' soars". Los Angeles Times. Retrieved July 6, 2010. ^ Shetty, Sharan (September 6, 2015). "Here's a Supercut of All the Potshots Psych Took at The Mentalist". Slate. Retrieved December 25, 2017. ^ Henne, B.G. (September 2, 2015). "Supercut proves Psych took a lot of potshots at The Mentalist". The A.V. Club. Retrieved December 25, 2017. ^ Gorman, Bill (September 30, 2008). "Top CBS Primetime Shows, September 22–28". TV by the Numbers. Retrieved April 3, 2009. ^ Seidman, Robert (May 27, 2009). "Top CBS Primetime Shows, May 18–24, 2009". TV by the Numbers. Retrieved June 3, 2009. ^ "SEASON PROGRAM RANKINGS (THROUGH 5/24)". ABCMedianet.com. May 24, 2009. Retrieved April 12, 2010. ^ Seidman, Robert (September 29, 2009). "TV Ratings: Sunday Night Football, House win week with adults 18–49; NCIS, NCIS: Los Angeles with total viewers…". TVbytheNumbers.com. Retrieved April 18, 2010. ^ Seidman, Robert (May 25, 2010). "TV Ratings Top 25: Dancing Tops Idol With Viewers Again, Lost Finale Wins With Adults 18–49". TV By The Numbers. Retrieved May 25, 2010. ^ Gorman, Bill (June 16, 2010). "Final 2009–10 Broadcast Primetime Show Average Viewership". Tvbythenumbers.com. Retrieved February 20, 2011. ^ Seidman, Robert (September 28, 2010). "TV Ratings Broadcast Top 25: 'Sunday Night Football', 'Glee,' 'Grey's Anatomy,' 'Dancing with the Stars' Top Premiere Week". TV by the Numbers. Retrieved September 28, 2010. ^ Seidman, Robert (May 20, 2011). "Thursday Final Ratings: 'American Idol,' 'Big Bang,' 'The Office,' 'Grey's,' 'Mentalist' Adjusted Up". TV by the Numbers. Retrieved May 21, 2011. ^ "2010–11 Season Broadcast Primetime Show Viewership Averages". Tvbythenumbers.com. June 1, 2011. Retrieved June 1, 2011. ^ Seidman, Robert (September 23, 2011). "Thursday Finals: 'Big Bang Theory,' 'The X Factor,' 'Parks & Recreation' and 'Whitney' Adjusted Up". TV by the Numbers. Retrieved September 24, 2011. ^ Bibel, Sara (May 18, 2012). "Thursday Final Ratings: 'American Idol', 'Grey's Anatomy', '30 Rock' Adjusted Up; 'Touch', 'Scandal' Adjusted Down". TV by the Numbers. Retrieved May 18, 2012. ^ Gormam, Bill (May 25, 2012). "Complete List Of 2011–12 Season TV Show Viewership: 'Sunday Night Football' Tops, Followed By 'American Idol,' 'NCIS' & 'Dancing With The Stars'". TV by the Numbers. Retrieved May 25, 2012. ^ Bibel, Sara (October 2, 2012). "Sunday Final Ratings: 'Once Upon A Time', 'The Simpsons', 'Bob's Burgers' Adjusted Up; '666 Park Avenue', '60 Minutes' Adjusted Down & Final Football Numbers". TV by the Numbers. Retrieved October 2, 2012. ^ Kondolojy, Amanda (May 7, 2013). "Sunday Final Ratings: 'The Amazing Race' & 'Celebrity Apprentice' Adjusted Up; 'Red Widow' Adjusted Down + Final FOX Numbers". TV by the Numbers. Retrieved May 8, 2013. ^ Bibel, Sara (May 29, 2013). "Complete List Of 2012-13 Season TV Show Viewership: 'Sunday Night Football' Tops, Followed By 'NCIS,' 'The Big Bang Theory' & 'NCIS: Los Angeles'". TV by the Numbers. Retrieved May 29, 2013. ^ Kondolojy, Amanda (May 20, 2014). "Sunday Final Ratings: 'The Amazing Race' & 'American Dream Builders' Adjusted Up". TV by the Numbers. Retrieved May 20, 2014. ^ "Full 2013-14 Series Rankings". Deadline Hollywood. May 23, 2014. Retrieved May 23, 2014. ^ Kondolojy, Amanda (December 3, 2014). "Sunday Final Ratings: 'America's Funniest Home Videos', Resurrection' & 'Once Upon a Time' Adjusted Up". TV by the Numbers. Retrieved December 3, 2014. ^ Bibel, Sara (February 19, 2015). "Wednesday Final Ratings: 'Empire', 'Arrow', 'American Idol' & 'Modern Family' Adjusted Up; 'The 100' & 'Stalker' Adjusted Down". TV by the Numbers. Retrieved February 19, 2015. ^ de Moraes, Lisa (May 21, 2015). "Full 2014-15 TV Season Series Rankings: Football & 'Empire' Ruled". Deadline Holywood. Retrieved May 24, 2015. ^ "People's Choice Awards 2009 Nominees". People's Choice Awards. Retrieved November 24, 2011. ^ "61st Primetime Emmy Awards Nominations" (PDF). Academy of Television Arts & Sciences. Retrieved November 24, 2011. ^ Allen, Kate (September 7, 2009). "Coben, Cole, Atkinson vie for crime awards". The Bookseller. Archived from the original on September 10, 2009. Retrieved September 7, 2009. ^ "The 16th Annual Screen Actors Guild Awards". Screen Actors Guild. Retrieved November 24, 2011. ^ "IIG website". Iigwest.com. August 21, 2010. Retrieved February 20, 2011. ^ "'Modern Family,' 'Breaking Bad' Nab Prizes At Monte-Carlo TV Festival". Deadline. June 13, 2013. ^ Oldenburg, Ann (November 5, 2013). "People's Choice Awards 2014 nominations are out". USA Today. Wikimedia Commons has media related to The Mentalist.